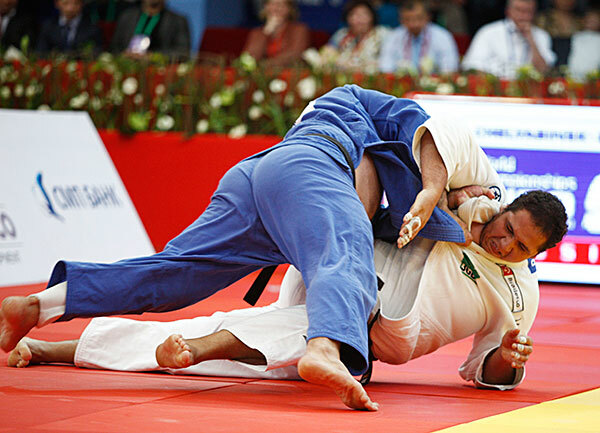 Today (Sunday) was the second and final day of the thrilling 2013 World Judo Masters at the Palace of Sport in Siberia.Seven weight categories saw action as the women’s -70kg, -78kg, +78kg categories and men’s -81kg, -90kg, -100kg and +100kg categories all crowned medallists in Tyumen. The two-day event, which featured 199 judoka from 41 countries, received high praise from Mr. Vladimir BARTA, IJF Head Sports Director. “I have always had a high regard for the judo federation here in Tyumen and they certainly delivered again. The crowd enjoyed the spectacle and the intimate venue led to an excellent atmosphere. After the action on the mat was concluded, there was awards for best male ippon and best female ippon. London 2012 Olympic bronze medallist Antoine VALOIS-FORTIER (CAN), who finished in fifth-place in the -81kg category, won best male ippon. -78kg bronze medallist Audrey TCHEUMEO (FRA) won best female ippon and should also be commended for her selfless act of aiding gold medallist Mayra AGUIAR (BRA) onto and off the medal podium after the Brazilian was unsteady on her feet as she was suffering from exhaustion. The World Judo Tour returns to Russia in July for the annual Moscow Grand Slam while all eyes will be on the country next year for the 2014 World Championships in Chelyabinsk. The next IJF World Judo Your event will be the Judo Grand Prix, Miami 2013, which will be held in Florida on June 15th and 16th. European champion Kim POLLING (NED) once again delivered on the big stage as she won the top prize in Tyumen. POLLING threw world number one Kelita ZUPANCIC (CAN) with an ippon-seoi-nage in the second minute to win the first of what will surely be many World Judo Masters titles. In the semi-final Olympic champion Lucie DECOSSE (FRA) suffered a flashback to the Paris Grand Slam as she was again defeated by POLLING. An inactive DECOSSE received three penalties while her rival had an unblemished record to seal a place in the final. In the second semi-final ZUPANCIC bested KIM Seongyeon (KOR) on penalties to confirm her place in the gold medal contest. The first bronze medal was won by Linda BOLDER (NED) who forced KIM to submit to an juji-gatame after a seamless transition into ne-waza. The second bronze medal was secured by a defiant DECOSSE who bounced back from a semi-final disappointment to overwhelm Onix CORTES ALDAMA (CUB) with an ouchi-gari for a waza-ari and ko-soto-gake for a yuko. After stepping off the medal podium DECOSSE confirmed she would retire after competing at the World Championships where she believes she could defeat rival POLLING. The -78kg title come down to a fascinating final between world number two Mayra AGUIAR (BRA) and world number three Abigel JOO (HUN). London 2012 bronze medallist AGUIAR proved too strong for European bronze medallist JOO as she countered an attack from the Hungarian with some ashi-waza of her own for a decisive waza-ari. In the first semi-final AGUIAR caught JEONG Gyeong-Mi (KOR) with a well executed piece of ashi-waza and surged forward for ippon. In the second semi-final JOO received three penalties against world number four Lucie LOUETTE (FRA) but the Hungarian standout dug deep to fire LOUETTE over with a ashi-waza. 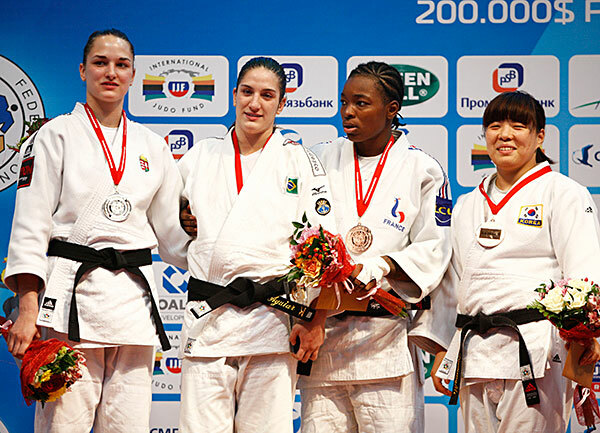 The first bronze medal was secured by London 2012 bronze medallist Audrey TCHEUMEO (FRA) as her teammate LOUETTE was penalised on four occasions to receive hansokumake. The second bronze medal was presented to JEONG who bested SATO Ruika (JPN) on penalties. 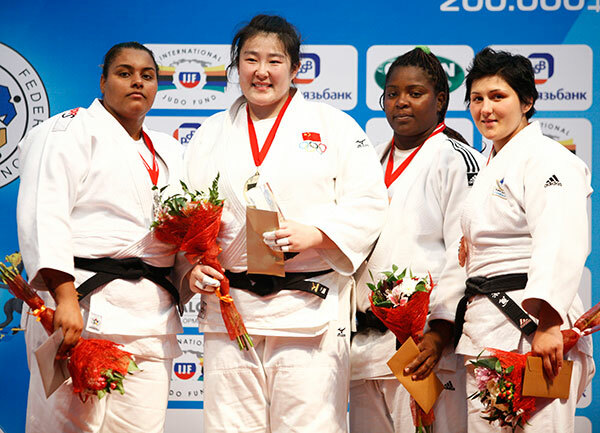 Qingdao Grand Prix winner YU Song (CHN) won a career-best World Judo Masters gold medal in an uneventful final. Her rival and world number two Maria Suelen ALTHEMAN (BRA) received a fourth shido in the fifth and final minute, one more than YU had received, to end the contest with hansokumake. In the first semi-final YU emphatically defeated Lucija POLAVDER (SLO) by ippon in 27 seconds while the second semi-final saw Maria Suelen ALTHEMAN (BRA) take the win as she countered an attack from Heidy ABREU (CUB) with a ko-soto-gari for ippon. 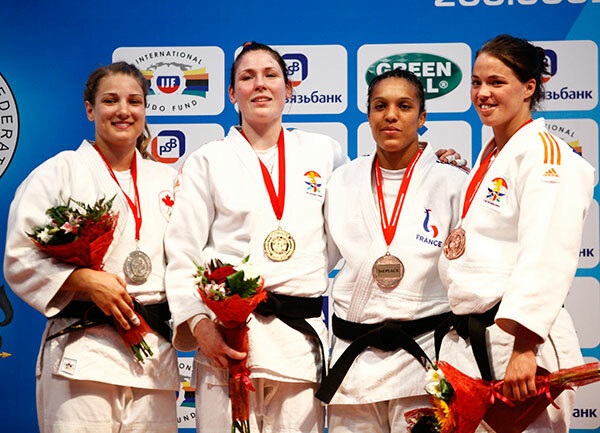 The first bronze medal was awarded to POLAVDER who submitted world number five Emilie ANDEOL (FRA) with a wrist lock. The second bronze medal was won by Olympic champion Idalys ORTIZ (CUB) as her teammate ABREU received hansokumake for collecting four penalties. World number 16 Ivan Nifontov come out on top in the -81kg category as he defeated Paris Grand Slam bronze medallist Keita NAGASHIMA (JPN) with a juji-gatame. While many of the leading names had to be content with repechage action, NIFONTOV prospered as the crowd spurred him on to win the prestigious gold medal as he clung on to NAGASHIMA’s arm as the Japanese judoka tried to climb to his feet to escape. The first semi-final saw NIFONTOV and world number five Antoine VALOIS-FORTIER (CAN) renew acquaintances having stood side-by-side as bronze medallists on the London 2012 medal podium. FORTIER, who was been visiting schools in Canada with his Olympic medal to inspire the next generation, only returned to full training in February and showed he’s on track to be in peak physical condition for the World Championships. 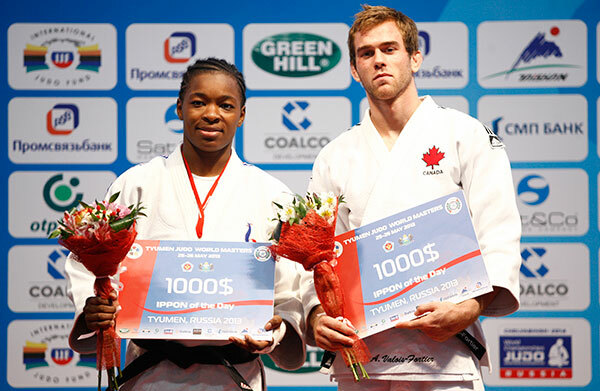 But in the semi-final, NIFONTOV was lifted by the home crowd and threw the Canadian with a drop seoi-nage for ippon. In the second semi-final NAGASHIMA was triumphant as he toppled former European silver medallist Murat KHABACHIROV (RUS) by ippon. 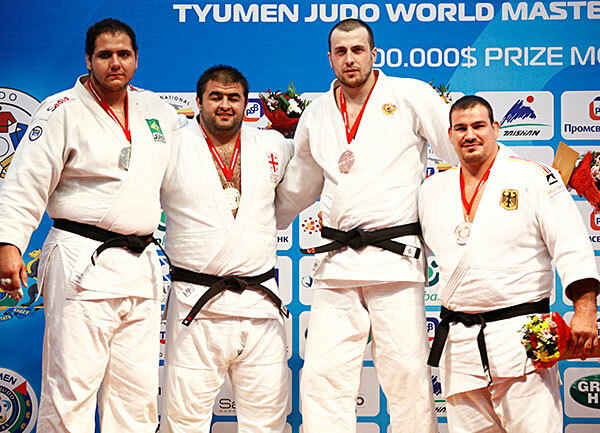 The first bronze medal was clinched by world number one Victor PENALBER (BRA) who ensured he wouldn’t suffer a fruitless competition as he held down former European silver medallist KHABACHIROV with a kuzure-kesa-gatame while the second bronze medal was won by world number three Avtandil TCHRIKISHVILI (GEO) who bundled over VALOIS-FORTIER for a yuko. 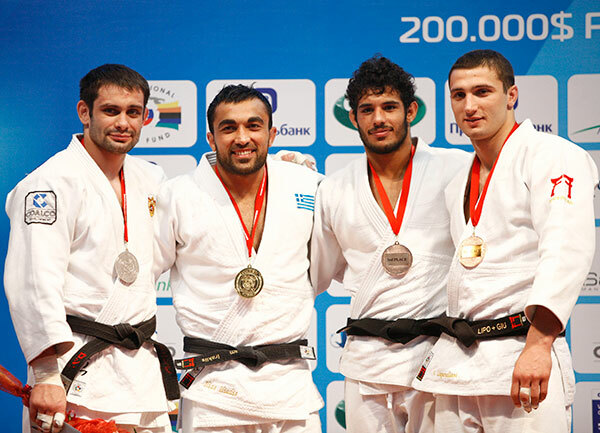 London 2012 bronze medallist Ilias ILIADIS (GRE) showed some characteristic explosive judo on his way to winning gold in a formidable -90kg field. However, the final with Kirill DENISOV (RUS) could not take place as home judoka was unable to compete in after suffering a recurrence of a hand injury which saw Greek star ILIADIS awarded the victory. The first semi-final was a repeat of the -90kg European Championship final and, to the home supporters delight, the outcome was the same. World number one Varlam LIPARTELIANI (GEO) received a penalty which settled the contest against DENISOV who sealed the final spot on the medal podium. In the second semi-final Olympic silver medallist Asley GONZALEZ (CUB) had a hard time living with ILIADIS and accumulated four penalties to receive hansokumake which ended his bid for a place in the -90kg final. The first bronze medal was won by LIPARTELIANI who marked the national day of Georgia in style as he pulled on the arm of Hatem ABD EL AKHER (EGY) for a juji-gatame. The second bronze medal went to Asley GONZALEZ (CUB) who outlasted SHIMOWADA Shohei (JPN) as he secured a place on the medal podium with a tai-otoshi for a yuko with only 25 seconds remaining. World number two Henk GROL (NED) lost his second consecutive World Judo Masters final after losing out to the hard-working Elkhan MAMMADOV (AZE). 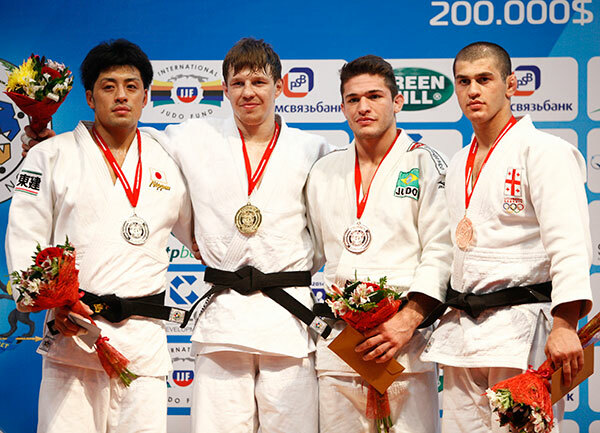 London 2012 bronze medallist GROL was caught for a yuko by the Baku Grand Slam winner who showed he’s still in the prime of his career at the age of 31. In the first semi-final MAMMADOV was not content to defend his advantage of two penalties against Sergei SAMOILOVICH (RUS) and went on the attack. His commendable fighting spirit was rewarded as he produced a ko-uchi-gari for ippon. In the second semi-final the reigning World Judo Masters silver medallist GROL emerged to defeat Cyrille MARET (FRA) by waza-ari. 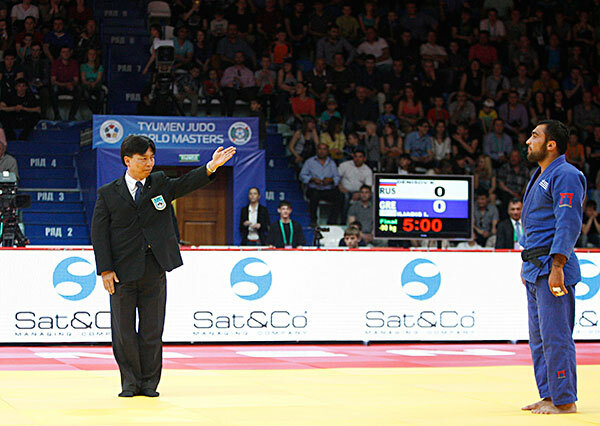 The first bronze medal was won by MARET who launched Ramziddin SAYIDOV (UZB) with a harai-goshi for ippon. 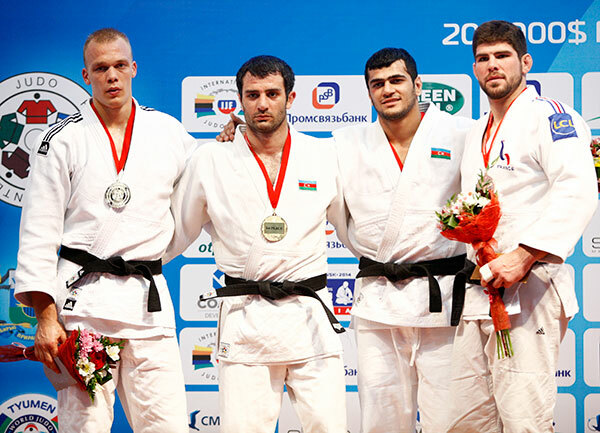 The second bronze medal was awarded to Elmar GASIMOV (AZE) who frustrated SAMOILOVICH and the Russian fans by defending his waza-ari advantage before adding two yuko scores. World number four Adam OKRUASHVILI (GEO) bested reigning World Judo Masters champion Rafael SILVA (BRAZ) with a clinical performance in the heavyweight final. As the finalists squared off in their first meeting it was OKRUASHVILI who captured the gold medal and with it the headlines. The Georgian opened the scoring as he turned SILVA over from an uchi-mata attempt for a yuko and added a waza-ari before sealing the win with a hold down as he transitioned from a mune-gatame to a kuzure-kesa-gatame. The first semi-final was an all-Brazilian affair as SILVA and world number 10 David MOURA (BRA) met for a place in the +100kg final. SILVA showed quick reflexes to win by waza-ari as he countered MOURA’s uchi-mata attempt with sheer strength to use his hulking frame to force MOURA onto his back for ippon. The second semi-final saw OKRUASHVILI step up the pace to defeat South American champion Walter SANTOS (BRA) by ippon with 21 seconds left and deny an all-Brazilian final. SANTOS had upset London 2012 bronze medallist Andreas TOELZER (GER) in the quarter-final. The first bronze medal was claimed by TOELZER who managed to get MOURA off balance with an uchi-mata attempt and used his power to follow through and earn the ippon. The second bronze medal was clinched by Renat SAIDOV (RUS) who sent the crowd into raptures as he lifted SANTOS with a spinning uch-mata for ippon.